BANDAR SERI BEGAWAN, Nov. 19 ,China and Brunei on Monday agreed to upgrade their relations to a strategic cooperative partnership. The two countries also pledged to be good partners featuring mutual trust in politics, mutual benefit in economy, mutual understanding in people-to-people and cultural exchanges, and mutual assistance in multilateral affairs. The consensus was reached during talks between visiting Chinese President Xi Jinping and Brunei's Sultan Haji Hassanal Bolkiah. "The decision made by our two sides to establish a strategic cooperative partnership is to ... deliver greater benefits to our two peoples through our cooperation," Xi said. Xi arrived here on Sunday for a state visit to Brunei, the first by a Chinese head of state in 13 years to the Southeast Asian nation. 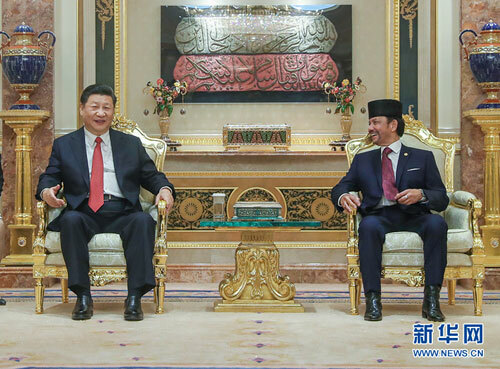 During the talks, Xi expressed high appreciation to the Sultan for the great importance he has long attached to developing the China-Brunei relations. The Chinese president said he was deeply impressed by the warmth and hospitality of the Bruneian people on his first visit to the country, which Xi said vividly testifies to the profound friendship between the two peoples. Xi praised the bilateral ties, saying that China and Brunei enjoy a long and deep historical and cultural link, and are close neighbors across the sea as well as friends and partners who trust each other. During the talks, Xi called on the two sides to increase high-level exchanges to well steer the vessel of bilateral relations. 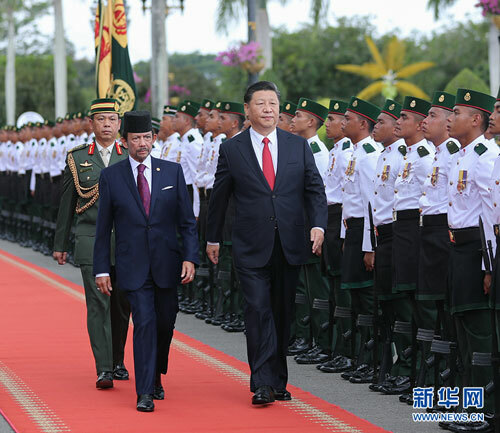 China appreciates Brunei's firm adherence to the one-China policy and will continue to support Brunei in pursuing a development path that suits its own national conditions, Xi said. China sees Brunei as an important partner for cooperation in building the 21st Century Maritime Silk Road and is willing to align the Belt and Road Initiative with Brunei's Wawasan 2035, a strategy for economic diversification, in a bid to boost the mutually beneficial cooperation between the two countries, he said. Brunei's businesses are welcome to expand exports to China, Xi said, adding that China stands ready to strengthen cooperation with Brunei in infrastructure construction, agriculture, fishery, energy and other areas, and share the experience in developing digital economy, e-commerce and other emerging sectors. The Chinese president urged the two sides to enhance cooperation in education, culture, sports, health and tourism, promote understanding and friendship between the youths, expand exchanges at sub-national level, and boost cooperation in judiciary, counter-terrorism and crackdown on cross-border crime. Xi also proposed that the two countries deepen communication, coordination and collaboration within the frameworks such as the United Nations and the Asia-Pacific Economic Cooperation (APEC), and jointly promote greater development in China-ASEAN relations and East Asia cooperation. China supports the Brunei Darussalam-Indonesia-Malaysia-Philippines East ASEAN Growth Area (BIMP-EAGA) cooperation and ASEAN in achieving a comprehensive, balanced development, he said. On the South China Sea, Xi pointed out that it is in the vital interests of both China and Brunei to safeguard peace and stability in the South China Sea and also the shared aspiration of both peoples. Xi said that China appreciates the dual-track approach proposed by Brunei: disputes should be handled through friendly consultation by parties concerned and countries in the region should jointly safeguard stability in the South China Sea. Both sides should continue to advance maritime cooperation and the negotiations on the Code of Conduct (COC) in the South China Sea, thus building the sea into a sea of peace, friendship and cooperation, he added. For his part, Hassanal extended warm welcome to Xi for his first state visit to Brunei, saying that the visit will deepen the traditional friendly relations between the two countries and strengthen mutually beneficial cooperation in all areas. He said that Brunei and China enjoy a long history of friendship and the bilateral relations have continuously developed on the basis of mutual respect and mutual benefit. The Sultan said he is delighted that the bilateral ties were upgraded to a strategic cooperative partnership during Xi's visit. Brunei firmly adheres to the one-China policy and will take this visit as an opportunity to promote bilateral cooperation in trade, investment, agriculture, tourism, education, people-to-people and cultural exchanges, and judicial assistance, thus benefiting the two peoples, he said. Brunei admires China for its remarkable achievements in poverty reduction and sustainable development, and is willing to promote synergy and cooperation between the Wawasan 2035 and the Belt and Road Initiative, Hassanal said. He said that Brunei highly appreciates the important role of China in fostering global stability and prosperity, tackling climate change, safeguarding multilateral trading system, and promoting regional economic integration, and is grateful to China for supporting BIMP-EAGA cooperation. Brunei stands ready to increase communication and coordination with China in international and regional affairs, and push forward ASEAN-China cooperation to a deeper level, he said. Brunei is delighted that countries in the region jointly safeguard peace and stability in the South China Sea and advance maritime cooperation through dialogue and consultation, he added. After the talks, the two heads of state witnessed the signing of a cooperation plan on jointly promoting the Belt and Road Initiative and other bilateral cooperation documents. A joint statement was also issued. A grand welcome ceremony was held at Istana Nurul Iman, Brunei's royal palace, where Xi talked to members of Brunei's royal family. He told them that the Chinese side appreciates the long-term friendly policy upheld by the royal family toward China and the traditional friendship will be carried forward. Xi also welcomed them to visit China more often. Brunei is the second stop of Xi's ongoing Asia-Pacific tour, which has already taken him to Papua New Guinea. He will also visit the Philippines. In Papua New Guinea, Xi paid a state visit and attended the 26th APEC Economic Leaders' Meeting. He also met with leaders of eight Pacific island countries that have diplomatic ties with China.